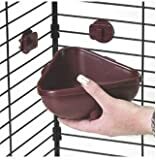 Hang-n-lock corner crock is the first food bowl specifically designed for small animals. It features two special brackets that securely fasten the bowl to any wire cage, yet simply detaches to make refilling fast and easy. Hang-n-lock corner crock’s durable plastic construction makes it shatter proof, plus its unique corner design conserves precious cage space and keeps food from scattering. Hang-n-lock holds 16-ounce of your pets favorite food and is dishwasher safe. Available in four different colors. This entry was posted in Small Animals and tagged Animal, Colors, Corner, Crock, Ferret, HangNLock, Hutches, marchioro, Small, smallpet, Super, Vary by One Boutique. Bookmark the permalink.